When anthropologists go into the field, they do so to study the "other"—i.e., the people and their culture that is different and distant from the anthropologist's own native history. Globalization has reduced some of the alien nature assigned to the other. Ethnically diverse neighborhoods, like Jackson Heights, reveal a mixing of cultures and traditions that was not possible in the early beginnings of anthropology. Yet the other still encompasses a sense of the foreign. Entering their fieldwork sites, anthropologists are as much others to the host culture as their ethnographic subjects are others to them. In those early months, while becoming acclimated to the host culture and finding their places in the host society, anthropologists are very much like tourists—although I have to stress that no anthropologist would think of herself in that way. The worst thing one could anthropologically be is a tourist. After all, tourists are largely ignorant of the host society's norms and are transient whereas anthropologists look for acceptance to the host society by adopting the host culture as their own and establishing lifelong ties to the community where they work. 1. They are not dressed for work on a work day. As the saying goes, "When in Rome, do as the Romans do." Nothing makes you stand out more than your mode of dress—which is certainly held as a primary form of self-expression in the United States. Nonetheless, anthropologists looking to establish themselves in their field sites would be well advised that if their hosts wear hats made out of palm leaves, they should do so as well. In fact, the State Department's website actually cautions travelers to certain countries—women in particular—to adopt conservative fashion styles and to research customs and traditions. Of course, tourists are on vacation, and there are many people who don't have a prescribed form of "business" dress, but there is an overall sense of colors and style that infiltrate a region or even a locality. The bottom line is that you should know where you are going—do some research beforehand. 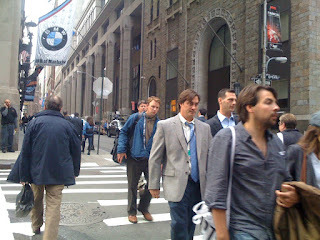 Image: In a "suit" culture, the non-suit tends to stand out. 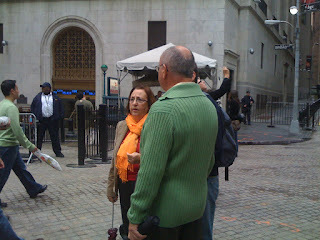 Image: Can you identify the tourists in this photo based on dress? 2. They travel in groups. There is certainly some truth to safety in numbers, and it's wonderful to share new experiences with people you love and care about, but groups attract attention. It's easier to fold an individual into the social rhythm, than it is for a group to blend in. 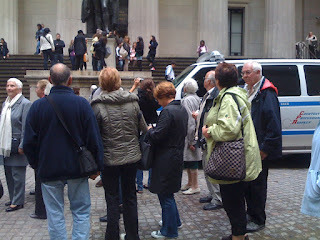 Image: Tour group in front of Federal Hall. 3. 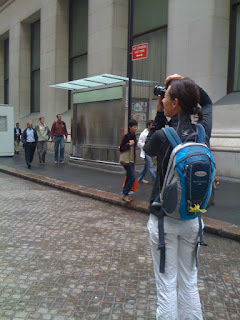 They prominently carry, display, and use cameras. Photos provide timeless records—but be mindful of what and whom you are photographing. Don't lose awareness of where you are just to get a photograph. Image: Photo opportunities are everywhere—but don't lose awareness of your surroundings in seeking that perfect shot. 4. They take "unusual" photos. Of course it's new to you—but "natives" pass it every single day, and they probably take it for granted. And if they do notice it, they really aren't creating artful poses for the camera—unless perhaps they're looking for a new Facebook photo. Again, photos provide a valuable record, so take them! But again, consider the image you are projecting with your camera strapped prominently around your neck. Ethnographers may want to opt for something a bit more discrete. And don't lose sight of social context. There are plenty of native shutterbugs. If you're trying to blend in, figure out when they come out and time your photographic adventures accordingly. And if you need an unusual shot for your Facebook profile—and it breaks with the ebb and flow of the host culture—do it quickly and without attracting too much attention. 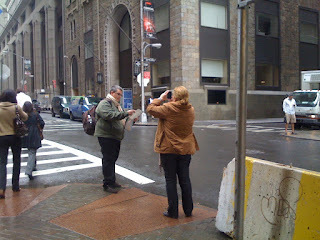 Image: "Artful" picture taking on a street corner. 5. 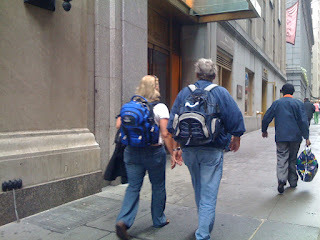 They carry fanny packs/large backpacks. Okay, so I spent some time talking about the increased presence of large bags on the subways, but this goes back to the first signal—if fanny packs aren't the norm, don't carry them! And unless you're working and living with a nomadic people, there's no need to carry all your belongings with you. Plus large backpacks can make you a target for less savory characters—bottom line: you want to be able to move with the flow of pedestrian traffic easily and comfortably. Image: Carrying large backpacks all day is surely tiring. Image: Are fanny packs the universal symbol of tourism? In most work environments, people move purposefully. 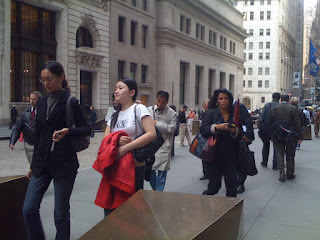 Of course, ethnographers will eventually want to meet people in a relaxed environment when they are more apt to talk, but unless you're in a recreational area, such as a park, or a social meeting place, lounging about signifies that you have no where else to be—and ultimately, that you don't fit into the social milieu. 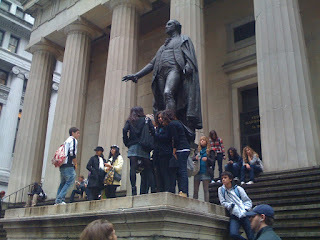 Image: George Washington's statue is a popular resting spot for tourists. 7. They often look confused. So you're in a new place on your own, and it's the first time you've ventured out. The sights and sounds are unfamiliar and the language is different. Yes, even the smells are different. This is not home! Don't panic and don't stand around looking lost and confused. Anthropologists—and really anyone looking to settle into an unknown—have to work at fitting in. So do some research before you leave your hotel room or apartment: read maps, check guidebooks, etc. Create a plan for each day that takes you farther away from your comfort zone. Make friends with a "native" if possible until you're comfortable wandering about on your own. If you want to belong, you have to plan to do so. Image: "Where do we go from here?" 8. They openly read guidebooks. Image: Leave your trusty guidebook in your apartment. 9. They disrupt the social flow of traffic. I think this one is the most important. I talked briefly about the stress the other creates for the host. One of the ways this occurs is through the disruption of the social rhythms of the host society. Every society has a flow, a pattern. It's not necessarily something you can learn from books. 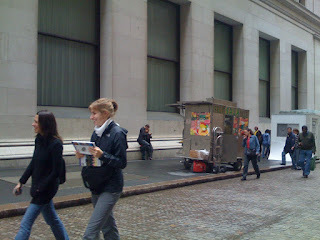 To fully understand the social flow of a place, you have to witness it, and your body needs to adjust to it. Research is still important—it will give you a sense of what to expect. A good way to acclimate to the social ebb and flow is through observation. In the early days of fieldwork, finding a good "people-watching" spot is key (and you can bring your maps and guidebooks with you for some reading on the side). 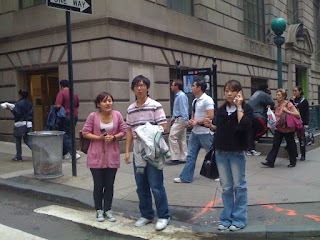 Image: Stopping on a street corner to answer a phone call holds up the pedestrian traffic and interrupts the social flow and rhythm. 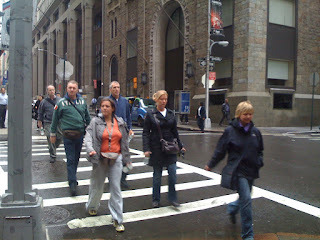 Image: Note what the "natives" do and follow along—take phone calls out of the line of traffic. 10. 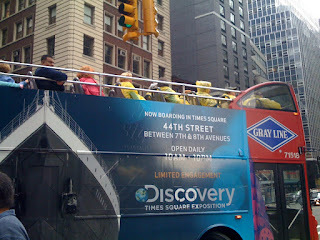 They ride tour buses while wearing yellow ponchos. In this age of globalization, every country has a tourism trade. If you don't want to get lumped in with these others, learn what the tourist traps are and avoid them. If the natives aren't doing it, you probably want to avoid it as well—unless, of course, you're studying tourism. The general theme that emerges regarding signals of otherness is that there are patterns to every culture and society. Ethnographers don't come into a social setting unarmed. They sometimes spend years preparing before reaching their field sites. Nonetheless, transitions can be difficult. Understanding markers of otherness can be the first step in easing the disruptions a lack of social knowledge can cause. Do you think there are additional markers of otherness that tourists can reveal? They wait for the green light--and sometimes don't even cross then.